As is quickly being made clear by Capcom, 2012 is the year of Resident Evil. 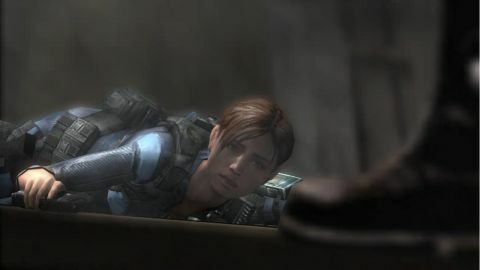 The franchise’s 15th anniversary is highlighted by multiple news games coming out, and it all starts with Resident Evil Revelations, a brand new portable adventure starring two of the series’ most popular characters. Can a slimmed down approach to RE’s traditional mix of scares and gunplay work on the three-dimensional handheld? The short answer: yes. Chronologically taking place between Resident Evil 4 and 5, Revelations’ plot provides some background on how the zombie-killing collective BSAA worked early in its inception. BSAA’s star agents Jill Valentine and Chris Redfield team up with some newer recruits to investigate around the globe a new threat from bioterrorist group Veltro. Though most of the game takes place on an abandoned cruise ship, the settings and timelines are constantly shifting in the surprisingly layered narrative. Unlike last year’s mediocre The Mercenaries 3D, Revelations is a full RE experience made for handhelds, with a real story, voice acting, and impressive use of the 3D visual effects. The world you explore isn’t as big or sweeping as in recent console titles, but the cramped feeling plays into the claustrophobic vibe, reminding you of early Resident Evil titles. We wouldn’t say the horror has completely returned in this game, but it’s a great effort. After the bright, open spaces of RE5, the darkly lit settings of Revelations brings back some of the horror the series once had, with shadows hiding enemies behind walls and doorways. The usually impactful gunplay is constant, but ammo is scarce enough to make you careful with your shots. Exploring the boat is a rewarding experience and there’s an interesting scanning mechanic that reminds us of Metroid Prime that makes each area a curious scavenger hunt. However, we didn’t enjoy the game’s standard first-person view when shooting, but that’s easily adjusted to RE’s current third person approach to gunplay in the options. A majority of the game takes place on the empty (save for the undead) boat The Queen Zenobia. Fans of Jill Valentine upset at how she was portrayed in RE5 will be very happy with her being the strong lead protagonist of the ensemble. Chris gets a fair amount of play time too, but we weren’t in love with all the new characters introduced. Some (particularly Parker and Jessica) are distinctive, but others (like a supposed comic relief duo) leave much to be desired. As the game continues, the way Revelations reuses certain levels multiple times only gets more frustrating as a heavy dose of backtracking is added in. It’s mixed up a little by sometimes backtracking while swimming, but the aquatic areas got old fast, even if they don’t happen often enough to be a deal breaker. Add to that the fact that the shifting setting occasionally makes it hard to keep track of where you are in the boat, meaning you’ll probably end up going in a circle at least once. Similarly recycled are the enemies, as the generic grey monsters filling the deserted rooms and hallways come in about four varieties. There’s a real lack of diversity in the regular enemy types, and we wish there were some real zombies to be found to spice things up. Fortunately that general repetition that pops up now and again is often alleviated by Revelations’ stupendous pacing which is perfectly suited for a handheld. The episodic nature of the story is assisted by video recaps at the start of the dozen different episodes, and though you can’t save at will, RER auto-saves often enough that it was never a problem. The story lasts 8-10 hours, with an Achievement-esque rewards system and co-op missions supplying even more replay value in addition to the New Game + available after you finish. Description Out of everything available on the 3DS, Resident Evil Revelations is a high profile effort that stands above most of the software youll find out there. The thoroughly M-rated adventure fulfills nearly every desire of RE fans, simultaneously fitting the new handheld perfectly thanks to a new episodic approach to storytelling. Its not a huge leap forward for the series, but it does prove that even on a handheld, Resident Evil can still be a good time.